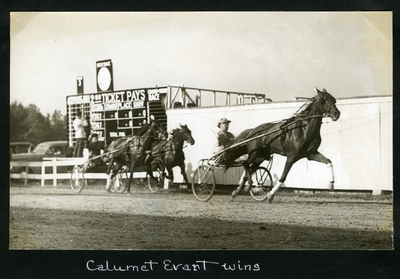 Black and white action photograph of the finish of the Classified Trot at the West Oxford Agricultural Society Race, Fryeburg, Maine. Chestnut gelding, Calumet Evart wearing head number one, Day up claimed the race in a time of 2.10 1/2. Bay mare, Orena Hanover, Jordan up, finished in second place. Brown gelding, Twinkle, wearing head number two, Phalen up, finished in third.